Vintage - Cut Crystal Bowl with Silver Plated Rim, 4 3/4" Diameter. Made by Leonard's of Italy. Condiment, or candy Dish, Circa 1960's. 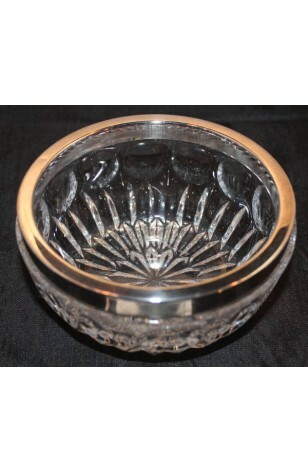 A lovely Leonard's of Italy Small Cut Crystal Condiment Dish with Silver Plated Rim. There is a Center Cut Daisy Pattern, surrounded by Diamond Cuts and a Top Row below the Rim is large indented Circles (or Thumb prints). Would make an attractive Nut, Mint or Candy Dish. Great Condition. A lovely Leonard's of Italy Small Cut Crystal Condiment Dish with Silver Plated Rim. There is a Center Cut Daisy Pattern, surrounded by Diamond Cuts and a Top Row below the Rim is large indented Circles (or Thumb prints). Would make an attractive Nut, Mint or Candy Dish. Very Good Resale Condition, no noticeable defects.